This page explains which discount tickets are eligible for CHIKA TOKU extra value offer. Extra value offer include discounts at any one of 360 shops around Tokyo Metro and Toei Subway stations when you show an eligible discount ticket. For more information, visit website of the Tokyo Metro or Tokyo Metropolitan Bureau of Transportation. 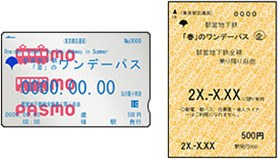 Valid for one day of unlimited rides on all Tokyo Metro and Toei Subway lines. This is for tourists visiting from outside Tokyo and from overseas. 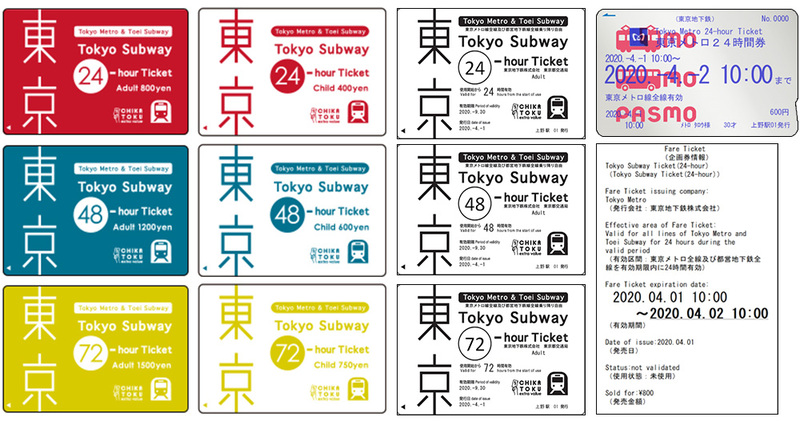 Valid for 24 hours to 48 hours from the start of use, visitors can travel on all Tokyo Metro and Toei Subway lines. This pass comes bundled with Tokyo Museum Excursion Pass and access to all Tokyo Metro and Toei Subway lines for 48 hours. This ticket offers unlimited travel on all Tokyo Metro and Toei Subway lines for up to 48 hours from the start of use. 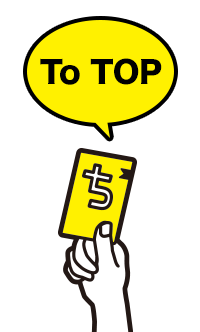 Valid for 24 hours from the start of use, rides on all Tokyo Metro lines. It can be purchased on the day of use or in advance. One-day tickets are good for unlimited rides on all Tokyo Metro lines from the first train to the last train on the day specified by the customer. This is for students on educational trips. 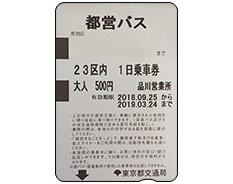 With this ticket, student visitors can use all Tokyo Metro lines for up to 24 hours from the start of use. This pass comes bundled with Tokyo Museum Excursion Pass and access to all Tokyo Metro lines for 24 hours. This ticket offers unlimited travel on all Tokyo Metro lines for up to 24 hours from the start of use. This ticket is for round-trip travel between Tokyo Station and Odawara Station or Atami Station by Shinkansen (non-reserved seat in an ordinary car) and unlimited rides on all Tokyo Metro lines. Toei One-Day Pass allow unlimited use of Toei subways, Toei buses, Tokyo Sakura Tram (Toden Arakawa Line), and Nippori-toneri Liner for one day. Valid for unlimited rides for one day on all Toei Subway lines. ※except for Toei buses, Tokyo Sakura Tram (Toden Arakawa Line), and Nippori-toneri Liner. Keio Line, Keio Inokashira Line, Tobu Line (except for Tojo Line and Ogose Line) and Tsukuba Express Lines. These passes allow unlimited use of Toei buses in Tokyo's 23 wards for one day. Tickets purchased in advance are valid for one day within six months of the date of purchase. These passes allow unlimited use of Tokyo Sakura Tram (Toden Arakawa Line) for one day. Tickets purchased in advance are valid for one day within six months of the date of purchase. One-day tickets are good for unlimited rides on Tokyo Metro, Toei Subway, Tokyo Sakura Tram (Toden Arakawa Line), Toei buses (except for buses with fixed seats, etc. ), all sections of Nippori-toneri Liner, and all JR lines within the Tokyo metropolitan area on the day specified by the customer for a month from the date of purchase. This is a convenient and money-saving way to travel from Haneda Airport to the heart of Tokyo and downtown. This pass includes a one-way ticket from Haneda Airport Domestic Terminal Station or Haneda Airport International Terminal Station on the Keikyu Line to Sengakuji Station and a common one-day ticket for all Tokyo Metro and Toei Subway lines. Check the websites for Tokyo Metro and Tokyo Metropolitan Transportation Bureau for more details on eligibility for the CHIKA TOKU and a railway map to see zones for unlimited rides.